How my hobby became a business. 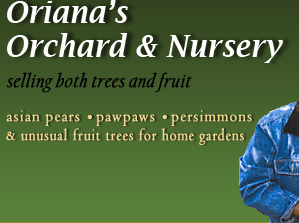 In the 70's I planted my first pear tree in my backyard. It was a variety named Kieffer. The tree was productive but the fruit wasn't that good. I knew I could do better. I then joined an amateur backyard fruit growing club, Midwest Fruit Explorers. There I learned about the many varieties of Asian pears, and I started experimenting. To conserve space, I'd graft 20 or more varieties onto a single tree. Soon my Skokie backyard was overflowing with Asian pear trees, and other fruiting plants. In 1996, I purchase 40-acre piece of property outside Freeport, Illinois. I have planted over 20 varieties of Asian pears on this property. I currently grow 7 varieties. I also grow black currants, pawpaws, mulberries, cornelian cherries and black walnuts. In 2012, I build a high tunnel green house for tender tree crops and Chinese culinary/medicinal plants. 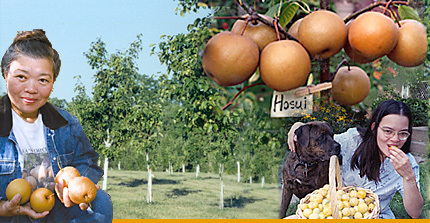 Fruit growing is a wonderful hobby, and I enjoy spreading the word about Asian pears. They have a wonderful taste, and are so easy to grow. Have a question, or want to place an order? I welcome all inquiries. Please feel free to contact me if you have any questions. To place an order, contact me by phone or email. Calling me is best. I'll confirm availability and we can figure out a pick up time and location. I do not ship. My plants are available by pickup only. This can be done at my Niles home (a suburb just north of Chicago); or by special arrangement at the Farmer’s Market events I attend, or my orchard. All produce and trees are organically grown. My orchard is located north of Freeport, near the Wisconsin border in Winslow, Illinois. If you'd like to see the orchard, please contact me to make special arrangements and receive driving directions.